The upcoming Locarno International Film Festival in Switzerland is to feature a retrospective of Marlen Khutsiev, a classic Soviet filmmaker who is best remembered for his films of the Khrushchev Thaw and the 1960s. In honor of the director and his achievements, RBTH takes a look back at the career and work of this important Soviet filmmaker. The Locarno International Film Festival, to be held in the Swiss city from August 5 to 15, will feature a retrospective of the classic Soviet filmmaker Marlen Khutsiev. Ahead of his 90th birthday, the director and screenwriter, whose creativity flourished during the Krushchev Thaw and the 1960s, will also be awarded a Leopard of Honor at the festival for his contribution to cinema. Several years ago, answering the question of what qualities are necessary to the director, Khutsiev said in an interview to Rossiyskaya Gazeta: “The absolute confidence in what you're doing, and persistent doubts about it. If any of these qualities outweighs [the others], it is bad. “The opinionated will decide that everything they have made is [a work of] genius. Indecision also leads to nothing. 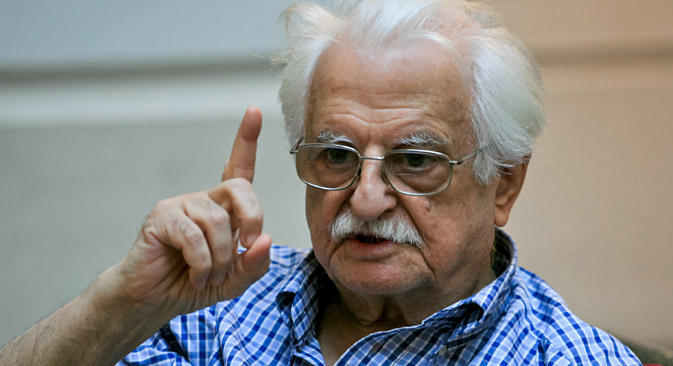 These two qualities are necessary to the director – all at once,” said the filmmaker, born in Tiflis (today Tbilisi, the capital of Georgia) in 1925. Certainty and doubt – this paradoxical recipe used by Khutsiev has become a source of genuine sincerity that distinguishes many of his acclaimed films – July Rain, Spring on Zarechnaya Street, and others. It was the film Spring on Zarechnaya Street, made at the Odessa film studios with former classmate Felix Mironer in 1956, that first brought the young director fame. The delicate, lyrical story of the postwar generation, its worries and dreams, and first love was highly appreciated not only by critics – it was watched by more than 30 million viewers. Khutsiev had begun his cinematic career six years earlier with a short film called The City Builders, his graduation project at the All-Union State Institute of Cinematography (VGIK), which he entered in 1945. But cinema had been an abiding passion for Khutsiev ever since he was a child. “My favorite picture was Chapayev [a 1934 film devoted to the story of Vasily Chapayev, a celebrated Red Army commander during the Russian Civil War – RBTH]. It was the first film I saw as a child. It’s remained my favorite ever since,” Khutsiev said later. His childhood memories were to have another significant influence on the director’s future work: His father, a pre-revolution Communist, was arrested in 1937 and convicted of counterrevolutionary crimes – a story that was to be reflected in Khutsiev’s films many years later. Khutsiev’s follow-up to Spring on Zarechnaya Street, The Two Fedors, was also the first lead role for Soviet author, actor and director Vasily Shukshin, who played the role of a soldier who had returned from the battlefield to start a new life. The epic Ilyich's Gate, both a dedication to and a manifesto for the 1960s, reflects the atmosphere of a great era of hope. The country had begun to experience greater cultural freedom from the early 1950s onward as the Khrushchev Thaw took root. Ironically, however, viewers did not see the original version until after perestroika. In 1962, the film was shelved by order of the Secretary General of the CPSU Central Committee, Nikita Khrushchev (he felt that the film “contrasts young people to the older generation” in a horrible manner). “I completed Ilyich's Gate, the picture was greatly received by Culture Minister Furtseva, and she tried to defend it when the film was taken to be shown to Khrushchev,” Khutsiev recalled. In 1965, the picture still was released under the title I Am Twenty, but in a censored version. It was only two decades later that Khutsiev was able to present the author's version of the film. However, even the edited version was once praised by none other than Federico Fellini. The Italian master, who had arrived in Moscow for the festival premiere of 8½, asked for a meeting with the director of the picture, who turned out to be surprisingly close to him in spirit. “You know, when you go to a new country, you always fear that your motives will not be shared, supported or understood. That is why I am glad about such a coincidence of motives,” Fellini said then. The director's talent was noted not only by Fellini; I Am Twenty was awarded a special prize at the Venice Film Festival. Khutsiev's filmography is rather modest, but some might say this accords each of his works with a greater value. July Rain, It Was in May, Scarlet Sail of Paris, Epilogue, and Infinity, which received two awards at the Berlin film festival – all his films are infused with a genuine faith in man and his bright future. “I am fundamentally against seamy stuff, because life never consists of one color in any case. This is the first. Secondly, I believe that art should provide hope,” the director said. Until recently, Khutsiev taught at VGIK and dealt with film issues at the Union of Cinematographers of Russia. Now the director is fully focused on his new work – Not Yet Evening, a film about the meetings of Leo Tolstoy and Anton Chekhov, which he conceived many years ago, but received funding for only recently. According to the director, his new work reveals the inner world of the great Russian authors, shows their attitude to life around them, to social phenomena and issues of death and immortality. In addition to his iconic films, the Khutsiev retrospective at the Locarno International Film Festival features Pyotr Shepotinnik's documentary about the creation of Not Yet Evening. According to Shepotinnik, this “observational film” will provide an insight into Khutsiev’s feelings as he films his new picture, and how it relates to his past works. Read more: Young Russian documentary filmmakers find professional success in U.S.